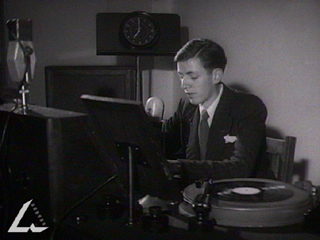 Video clip synopsis – An announcer reads the news headlines for ABC radio. Broadband MP4 drawl_bb.mp4 (1.2MB), suitable for iPods and computer downloads. The Aussie Drawl is an excerpt from the film 7 O’clock News, made in 1949 by the Australian National Film Board and produced by Commonwealth Film Laboratories for the Postmaster-General’s Department. The Aussie Drawl is on the website From Wireless to Web, produced in 2005. The media represents reality to audiences through the essential elements of selection, construction and representation. Each media form and process constructs an image or representation of an event, idea or story and represents it in a way which is different from the audience’s direct experience of reality. How would you identify or classify the accent used by the speaker? Do you think this is how most people spoke then? Why do you think this? How do you think this way of speaking differs from how we speak today? Do the accents of today’s newsreaders differ from the one in the clip? If so, how? Do you think there is a difference between commercial and non-commercial newsreaders such as Channel 10 and SBS? If so, why do you think they differ? Does the accent or way of speaking differ between the news and other shows such as comedies? What does this tell us about how we see the news? Read the Video Clip Context and view the video clip again. What does this tell us about how Australians at the time saw themselves? Do you think we still think the same today?